Maybe you woke up and decided to, finally, boost your social media presence for your business or brand. Maybe you have tried before and then life’s inertia took over, pushing social media to the back burner. Hey, don’t worry, we have all been there. 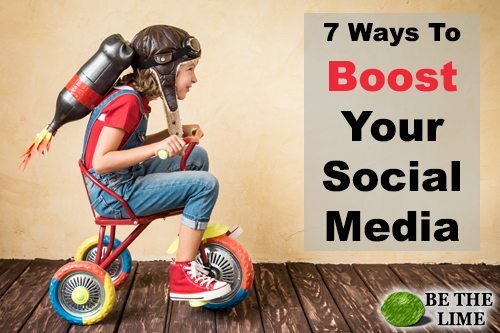 In either case, there are things you can do right now that will help jump-start or re-ignite your social media followers. The really good news is that it is going to be a lot easier than cleaning out those boxes you have sitting in your closet that you refuse to get rid of (and yet have not opened since 2011). So, without any further delay, here are some ways to bring those social media accounts back to life or launch new ones! 1. Advertise Yourself – Make sure your website mentions your Facebook Page. – Sure, you might have it at the very bottom of your site buried in with legal info, but why not really showcase it at the top with a cool graphic that says, “Like Us On Facebook!” – That would make it pretty clear what you want them to do. 2. Help me Help You (share my stuff) – If you post regularly on your website are their social media icons at the end of each post for “sharing?” There should be. 3. Just Ask – This is a big one for instant gain. Email your subscribers and ask them to visit, like, or follow you on social media. Don’t bury them with requesting they follow every account you might have…just the big ones like Facebook, Twitter, or Instagram. You can also do this IN Facebook. Have you “invited” everyone within Facebook to “Like” your page? 4. Email List is #1 – Speaking of subscribers, if you are not building an email database make that your number one priority this year! Really, I mean drop everything, let those holiday pears expire uneaten and start making a plan. You can start here. 5. Engage with everyone. – This might take a little time, but certainly worth the effort. If someone leaves a comment (on Facebook) or Tweet (on Twitter)…respond. 6. Give Something Away – Contests are awesome for increasing the number of people checking out your social media (and signing up for your email list). Check out Rafflecopter…one of my favs. 7. Read This Book Now – Be the Lime…the world has enough lemons. Available in BOTH paperback and Kindle versions it will certainly get you on track. Easy read and will really help you put a solid plan together without taking too much time. Hey…all those 5-star reviews can’t be wrong! Click Here To Get Your Copy. Most of these things can all be done in the same day or certainly within a couple days and they will pay off BIG down the road. Like Be the Lime FACEBOOK here. Follow Be the Lime TWITTER here. *That is my personal account…which is where I do most of my Twitter stuff…but you seem cool.